The Keihin Corporation was founded December 19, 1956 and currently maintains its head office in Shinjuku Ward, Tokyo, Japan. 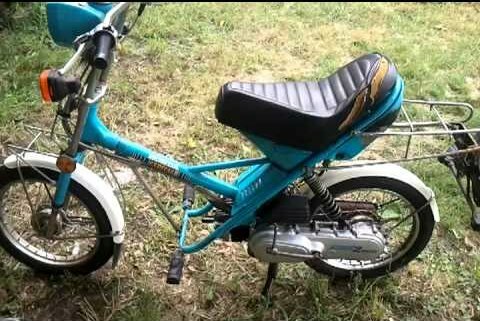 Among the products they are internationally known for is the production of carburetors and fuel injection, and is a major suppler to Honda, and also Triumph, Suzuki, Kawasaki, KTM and Harley Davidson motorcycles. In addition to carburetors, Keihin supplies the automotive industry with engine, transmission and climate control products, including intake manifold assemblies, HVAC assemblies, compressors, valves, solenoids and electronic control units. Keihin’s largest shareholder is Honda Motor Co. Ltd. Keihin first began U.S. manufacturing in 1989. Counting all U.S. locations, Keihin has more than 20,000 employees. Keihin North America’s corporate headquarters is in Anderson, Indiana. Keihin motorcycle carburetors are labeled with a cast-in model code followed by several numbers and letters that specify the settings for that application. 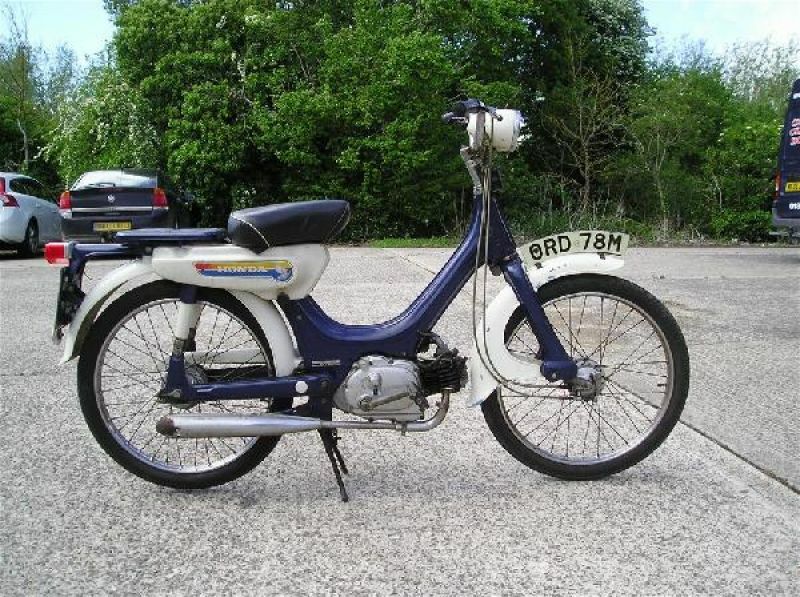 Except for the Honda PA50 (made in Belgium) carburetor, which is a unique design, these Honda moped, noped, mini-cycle, scooter and small motorcycle carbs are all model code “PA”. Other Keihin carburetor model codes are PB, PC, PD, PJ, PWK, CV, CVK, VB, VD, VE. 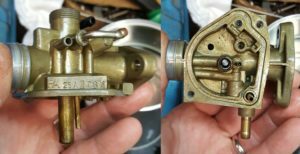 These are down-draft carburetors, unusual, like the wheel-motor design is. 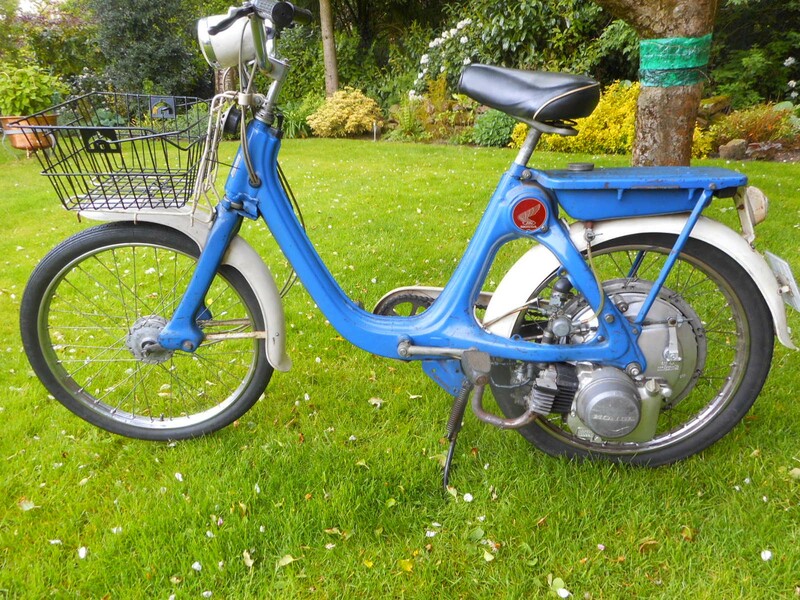 Before April 1970, the PC50 had a OHC engine (over head cam). 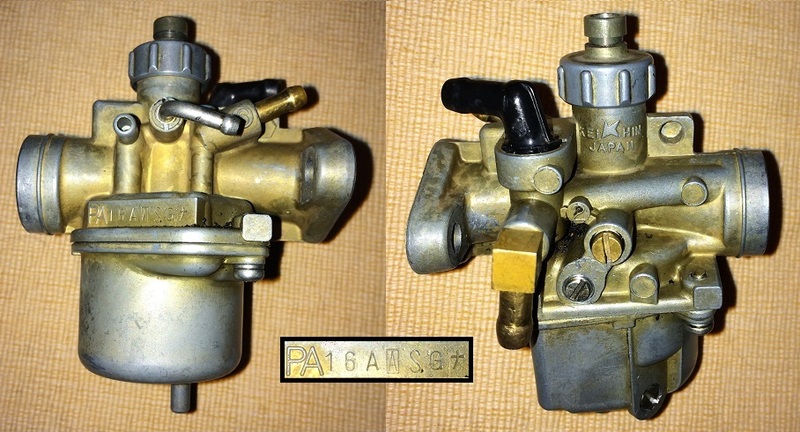 The C4B, C5A, C5B carburetors for the early 1969-70 PC50A were spigot mount type, 16100-063-004. They had a round float bowl gasket (with three flat sides when installed), a long push-in jet, jet pad, completely round “donut” float, all metal float needle with replaceable float seat. 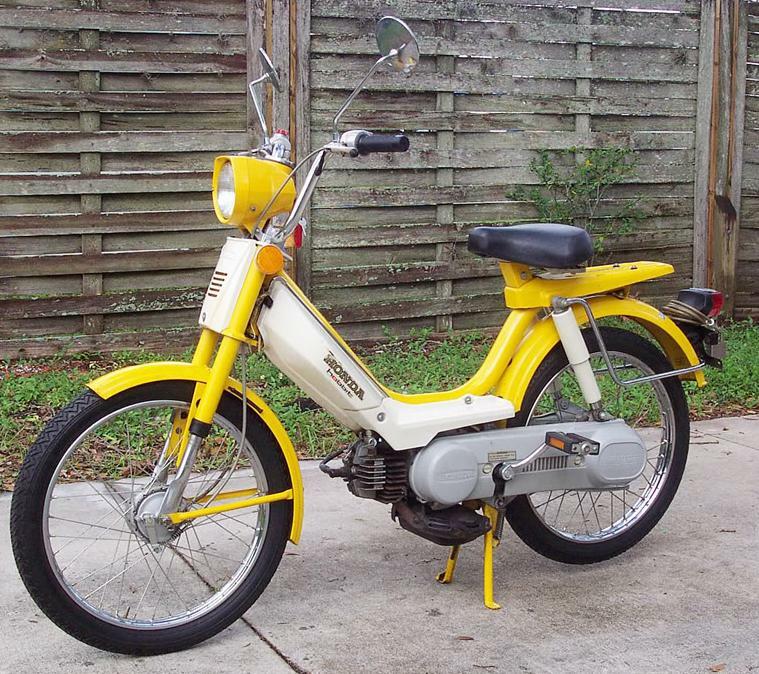 After April 1970, the PC50 had a OHV engine (over head valve) with pushrods instead of a cam chain. 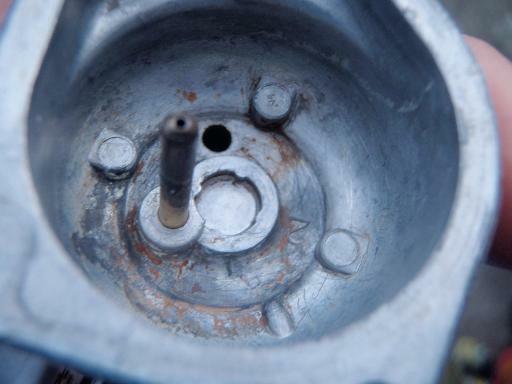 The F4A, F5A, carburetors for the 1970-74 PC50K1 were flange mount type, but everything else was the same, round float bowl gasket (with three flat sides when installed), a long push-in jet, jet pad, completely round “donut” float, all metal float needle with replaceable float seat. Keihin C5A carb, spigot mount. 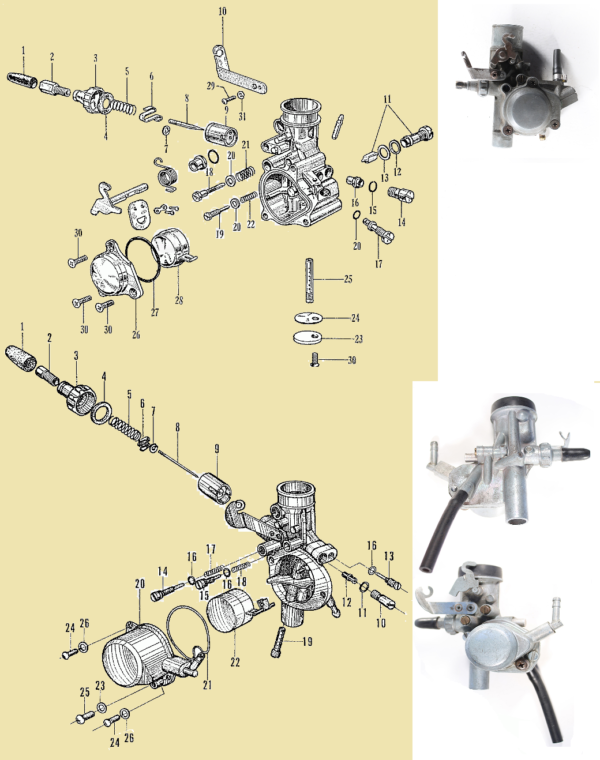 The 1970-74 Honda PC50K1 carburetor is illustrated below. The illustration there belongs here. But that is where it came from. Late PC50: The carburetor changed from “donut” float to a swinging float, and a NC50-type float bowl and gasket. 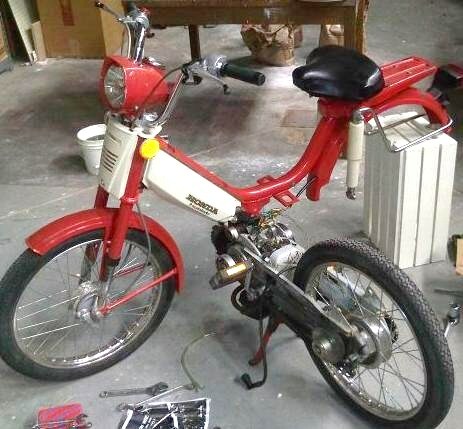 The 1975-77 PC50K1 and 1975-78 PF50 engine and carb are the same as the Taiwan remake engine and Keihin carburetor used on the 1978-80 Indian moped. So the carburetor parts are the same also, with a couple of exceptions. 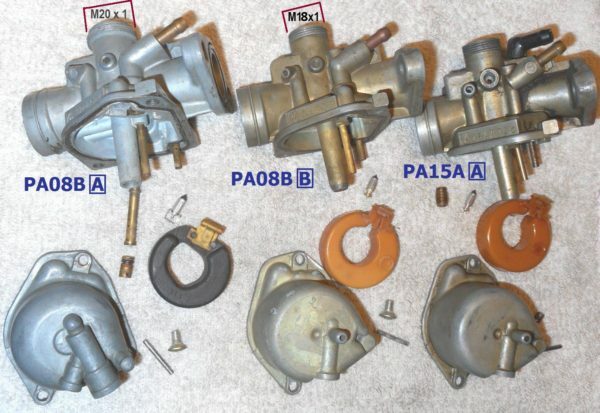 PA 00A (16100-081-024) and PA 01A (16100-099-693) have the same parts. The jet size and venturi size are the only difference. 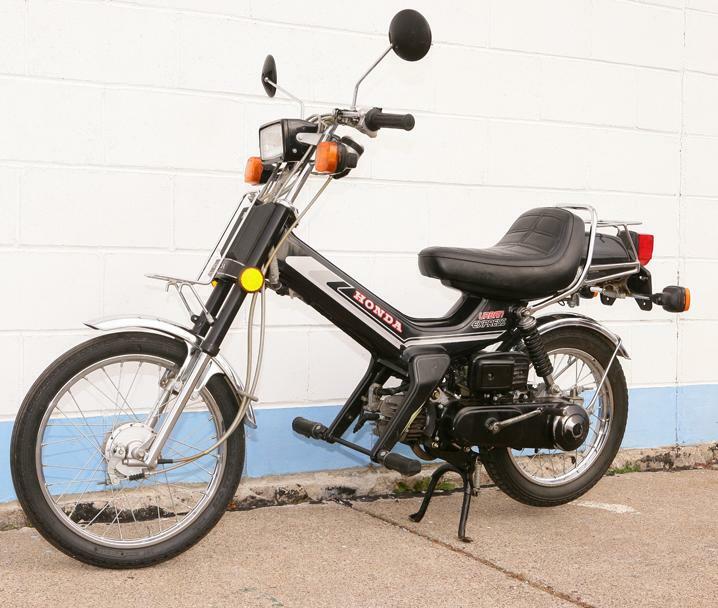 Indian AMI50: The Indian AMI50 Chief four stroke moped engine, OHV with pushrods and internal pedals, made from 1978-1984, is a Taiwan-made copy of a “late” Honda PC50 engine, OHV with pushrods and internal pedals, made from 1975-1978. 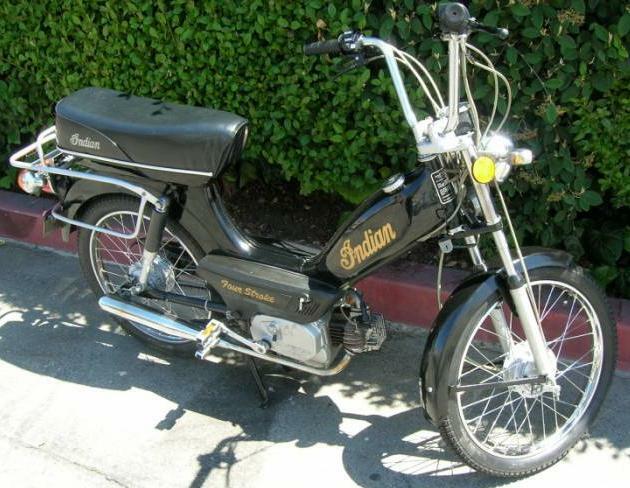 The Indian moped had three different carburetors, Tillotson (some 1978), Keihin (some 1978, most 1979-80), Mikuni (some 1980, all 1981-84). Only the Keihin parts are listed here. See Indian Parts for Mikuni items. The Keihin carb on Indian is the same as late PC50, except for the jet, jet pad, jet o-ring, and float bowl. The mount holes are also 32mm spacing, center-to-center. Most of these PA MOA parts are the same as in PA 08B section 6. Scroll down to those item numbers to see the prices there. Float Bowl: This Keihin carburetor illustration from the Indian Parts Manual shows a round bowl gasket, a round detached float, and a different float bowl. 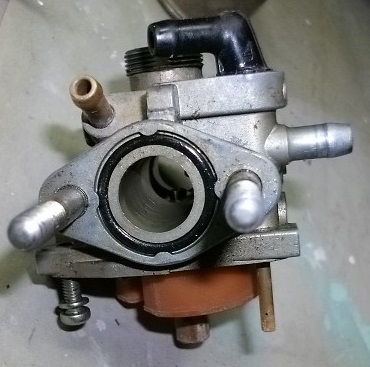 But the actual Indian carburetor has a #17 an NC50-type bowl gasket, #4 a swinging semi-round float, and #8 a Z50-type float bowl that is different from both NC50 type A shallow and NC50 type B deep float bowls. 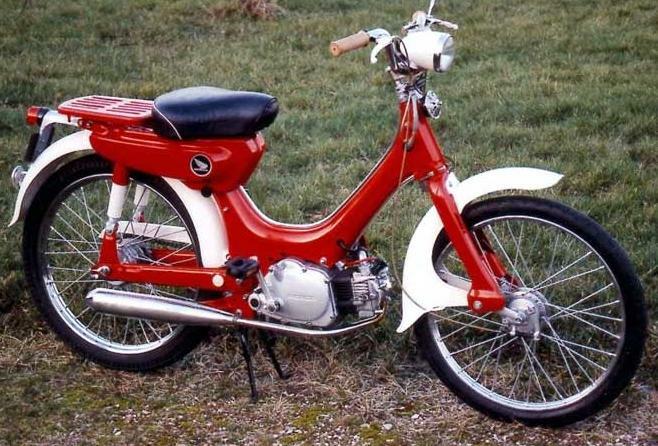 Honda’s successor to the four-stroke PC50 was the two-stroke PA50, known in the USA as Hobbit, and in Europe as Camino. 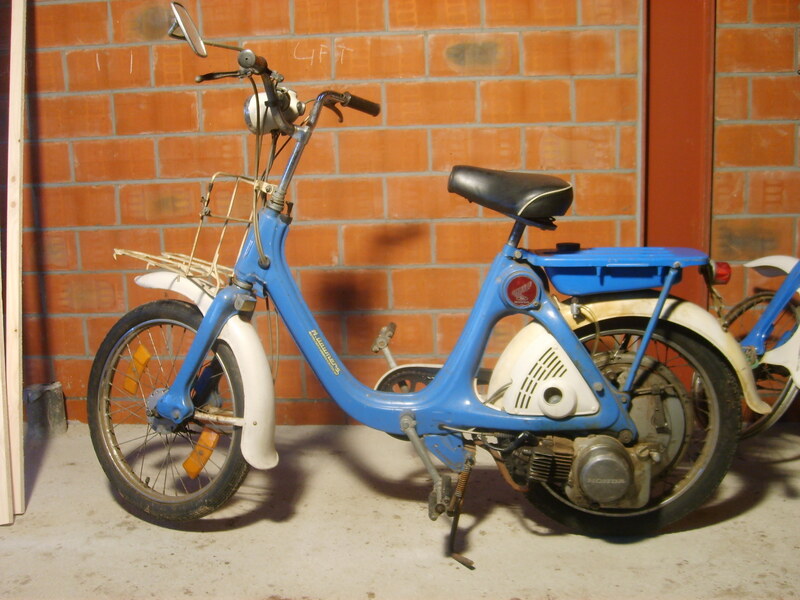 It was made in Belgium by Honda Benelux, so it had a mix of Japanese and European design and componentry. In US models, 20mph versions were 1978-79 red. 30mph versions were 1978-79 yellow, 1980 yellow, 1981-82 red, and 1983 black. 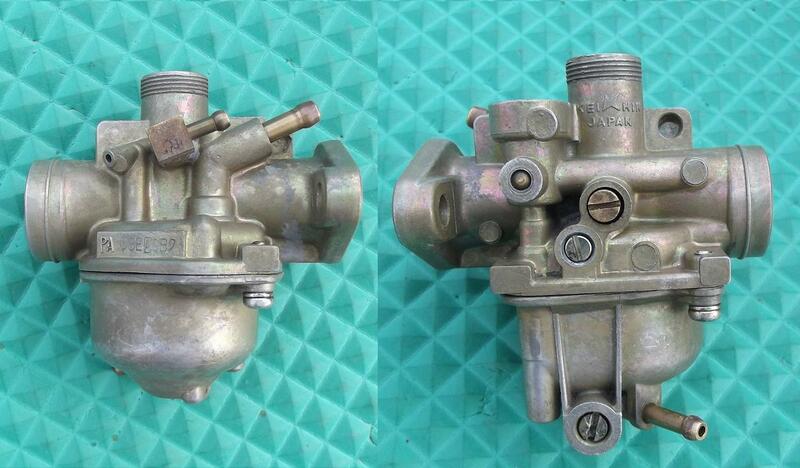 This Keihin BB type carburetor is not like any other moped carburetor. 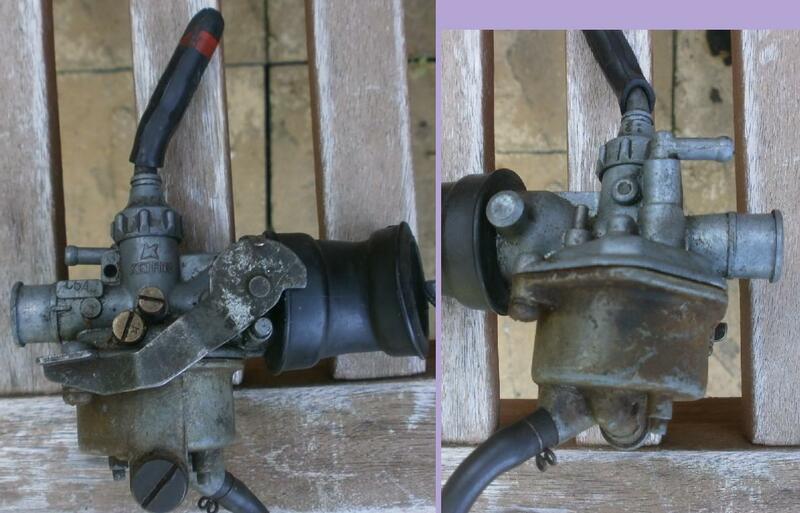 It looks more like a Honda generator carburetor. It is a very flat design. It has to be special because it swings up and down with the engine, and is very close to the frame at the place where you step through. Servicing: The best way to remove the PA50 carburetor is to hold the back of the bike up by either a rope tied to an overhead beam, or with a milk crate and blocks of wood. Remove the floorboards and side covers. Unplug the ignition wires from the coil at the right rear. Pull them through and move them out of the way. Disconnect the decompression cable and the spark plug cap. Loosen the wiring clamps so there is slack in the wires. Remove the lower rear shock bolts and the swing arm pivot bolt above the engine. Then the whole sub-frame can be moved away from the main frame, either by lifting the back of the bike up, or by swinging it around sideways. Note that the float bowl can go on two different ways. The wrong way assembles normally, but causes the vertical brass overflow tube to contact the float. Honda designed all of the cleaning ports, drain screws, and adjustment screws to face the right side of the bike, which is the upper left in the exploded view. The drain hose spigot on the float bowl faces the same way as the adjustment screws. The other way to tell is by shaking the carburetor. If you can hear the float rattling inside then the float is not stuck so the float bowl is on correctly. While every other moped carburetor is a sliding throttle valve type, this one is a swinging plate throttle valve. The reason is to be flatter, to get more clearance from the bottom of the frame. The manual choke is also a swinging plate, with an automatic release. 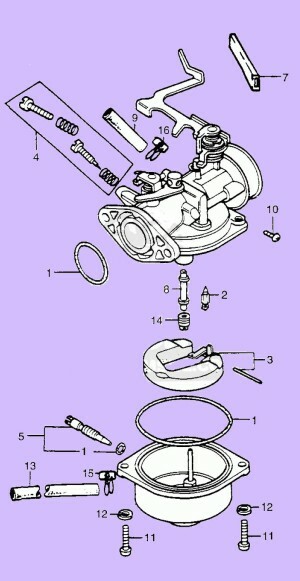 Some servicing can be done with the carburetor installed. It is easy to clean the idle passages and jet by spraying a one second long burst of carb spray into the idle mixture screw hole, followed by compressed air. The running engine is allowed to consume the flammable solvent before the next burst is sprayed in, to prevent the engine from getting flooded. 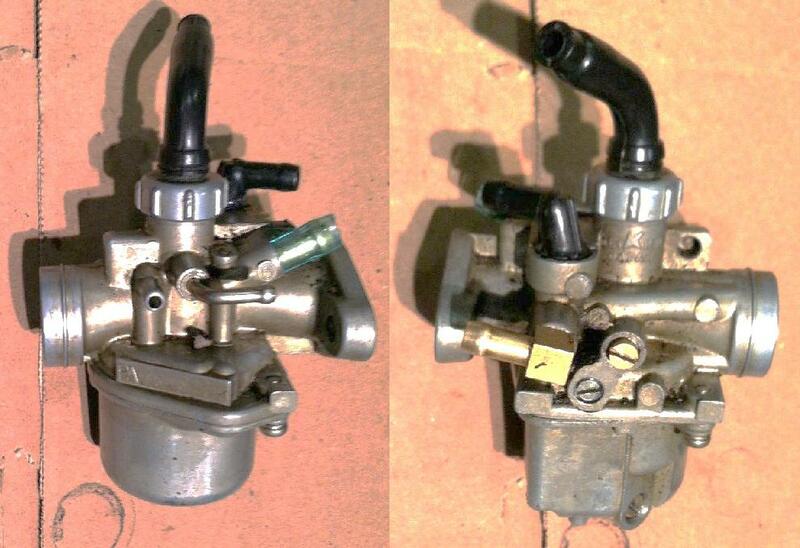 This carburetor has a throttle cable and a choke cable coming straight up and looping around. It has no vent hoses, vacuum hoses, or oil lines going into it. The oil injection goes into the intake manifold. The float reservoir vent is just a small tube slanting downward. The mount holes have a 38mm spacing, wider than the late PC50 flange mount baby Keihin. As with most Honda carburetors, fuel is never allowed to spill onto the engine or anything else. Instead an overflow tube inside the float chamber allows any overflow fuel to flow out and down the drain hose and onto the ground below the engine. 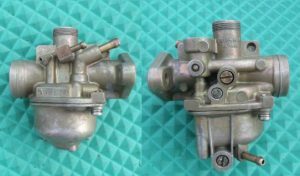 The 1977-79 Honda NC50 and NA50 each had two carburetor versions, PA08BA and PA08BB. Regardless of the year, or the VIN number, they could have either version. 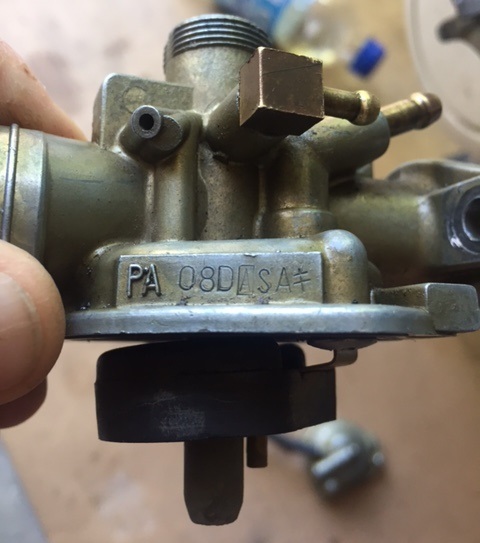 So the customer had to look at the model number stamped into the carburetor, and tell the Honda dealer that number, to get certain parts correct. 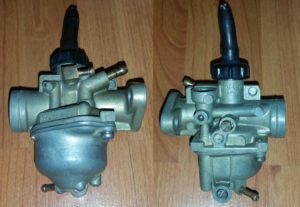 Honda Express carburetor versions, showing things that are different. Parts for Sale: Many new original things like the gasket set and float needle are still available. But the items crossed out are no longer available from Honda. For some of those, Myrons has found or made substitutes. Some part numbers have been superseded. Those obsolete part numbers are not listed here. Main Jet: On a PA08BB the main jet is a tamper-proof tight press-fit type, in the center. The jet cannot be removed, and cannot be replaced. On a PA08BA the main jet presses or slides in and out, and is supported by a rubber disk. If the disk is missing, the jet can slide downward, allowing fuel to get past the jet o-ring, causing a rich fuel mixture. 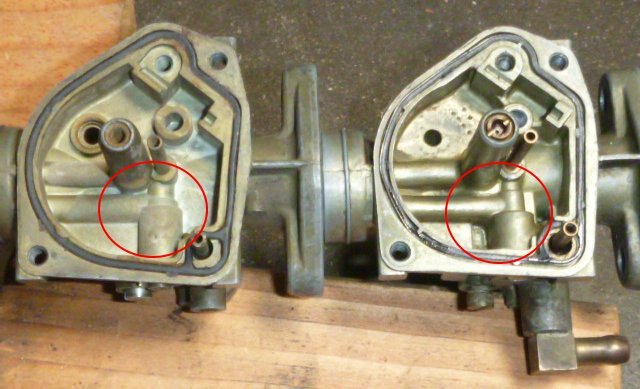 Idle Hole Cleaning: Near the engine side of the carb body is a brass tube that dips down into the liquid gasoline. That tube, about 1.5 mm (0.060″) inner diameter and 20mm long, leads to the idle or pilot jet, which is about 0.30 mm (0.012″). The idle jet gets clogged from sitting, then the engine will run but won’t idle. Nothing but a very thin (0.010″) steel guitar string will clean it out. See below about jet drills and cleaning tiny jets. Ultrasonic parts cleaners, carb spray, carb dip, and compressed air are not usually effective. Another way to clean out the idle jet is to 1) place a drill bit that fills the hole (so it does not get crushed), 2) clamp it with a small vise grips, 3) rotate back and forth while pulling, 4) when it comes out, the actual hole is easy to see and clean, 5) press it back in the same way it came out. Strong solvent is needed to dissolve varnish or tar residue left from years of sitting. Carburetor spray, parts dip, or acetone all help clean out the tar, sometimes with a lot of scraping, brushing or rubbing. Always remember to remove all rubber things first, to not let the rubber touch the solvent. Strong solvents will swell soft rubber, deforming it. Never soak the whole carburetor in strong solvent. In this way, Shaun (at Royal Cyclery and later at Myrons Mopeds) has successfully cleaned out over 100 Honda Express carburetors, without ever replacing any of the rubber gaskets. Part of the reason was they were only sold at Honda dealers, but nonetheless, they are not needed in a normal service or clean-out. Keihin PA08C-A: This is approximately for a 1979-80 NC50, or maybe NA50. It is identical to a PA08B-B. It has the same white float, non-stirrup float needle, fixed jet, 18mm top threads, and same gaskets. The idle mixture screw type is unknown. No photo available. Oil injection hose location: The 1977-79 Honda Express had the oil hose going into the intake manifold, not the carburetor. 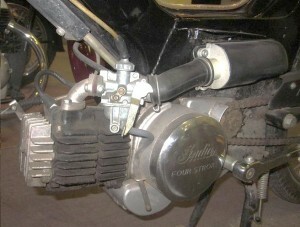 The 1980 and later models had the oil injection hose going into the carburetor at the throttle slide area. There must have been some benefit, like maybe throttle slide lubrication. PA08E-A is the same as a PA08B-A, except for three things. 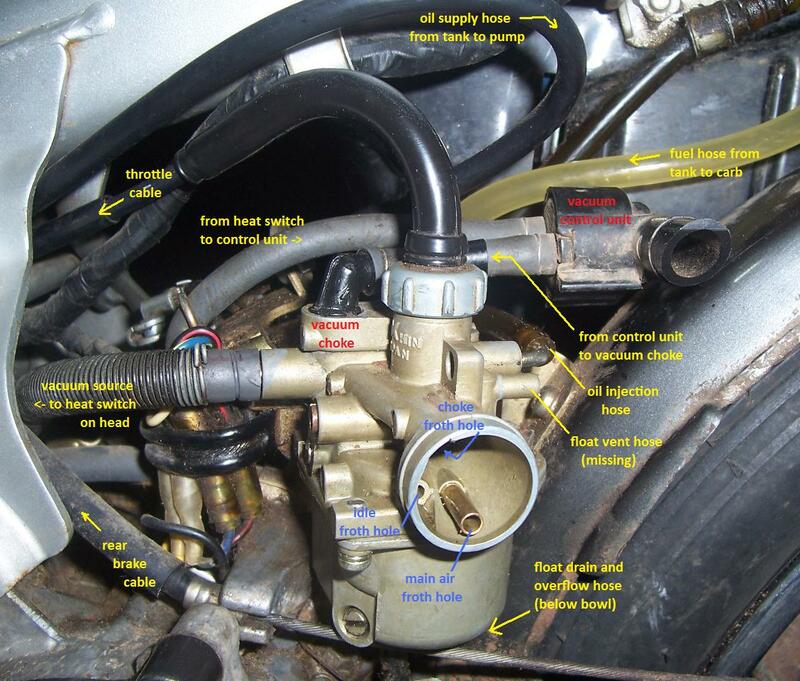 (1) It has an oil injection small hose spigot on the side near the fuel hose spigot. (2) It has a 18×1 thread top cap, like a PA08B-B has. (3) It has a Idle Fuel mixture screw, like a PA15A has, instead of an Idle Air mixture screw. See below. All of the other parts are the same as PA08B-A (cable choke, push-in jet with o-ring, black float, stirrup needle, shallow float bowl with rubber pad holding the jet in). See above. PA08E-B is the same as a PA08B-B, except for two things. (2) It has a screw-in main jet, instead of non-replaceable. All of the other parts are the same as PA08B-B (18mm top cap, idle air mixture screw, white float, non-stirrup needle, deep float bowl, cable choke). See above. PA08D-A is the same as a PA08B-B, except for two things. (2) It has a Idle Fuel mixture screw, like a PA15A has, instead of an Idle Air mixture screw. See below. All of the other parts are the same as PA08B-B (18mm top cap, white float, non-stirrup needle, non-replaceable jet, deep float bowl, cable choke). See above. 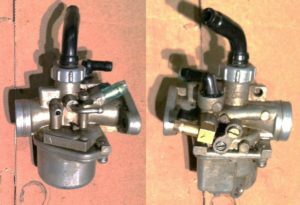 The 1981 Honda Express carburetor features a screw-in main jet, and a built-in vacuum-operated (not electric) automatic choke. When the temperature switch on the head is cold, it allows the engine vacuum to raise the choke plunger up, which opens a new fuel passage, to enrich the mixture during cold starting. As the engine warms up, it closes the vacuum, allowing the thin spring to pull it back down, for normal running. The PA16A-A looks identical to the PA15A-A. 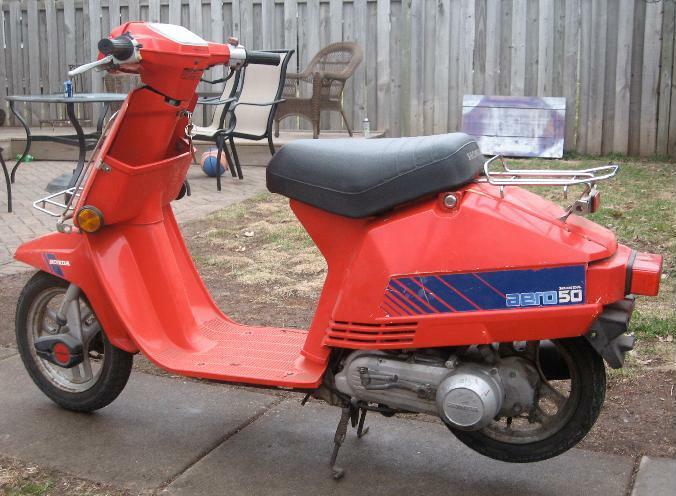 It is on the 1981 Honda NA50 Express II, the final year of that model. They both have a #75 screw-in jet and the non-stirrup type B float needle. The only difference must be the venturi shape or size. 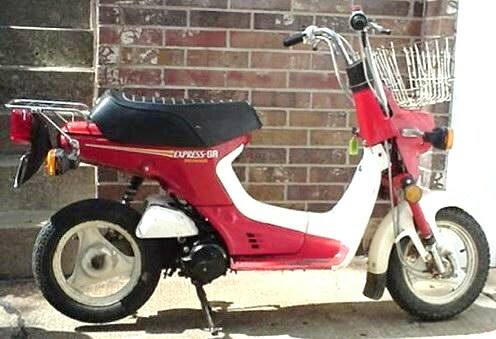 After 1983, 50cc Hondas had electric chokes, because they were electric-start scooters with 12 volt batteries. Float Valve Seat: On these carburetors the float seat (the cup that the float needle valve slides in) is carved into the actual carburetor body, and is not replaceable. Polish it with a spinning Q-tip and polish, such as Turtle Wax. Choke jet: On deep-float-bowl versions, there is a choke jet, pressed into a corner of the float bowl. When it gets clogged the engine will only start easily when it is warm. Verify all jets and fuel or air passageways are open, using wires and or visually with carb spray (wear goggles). Cable Differences: You can tell what year range a Honda Express is from a distance. 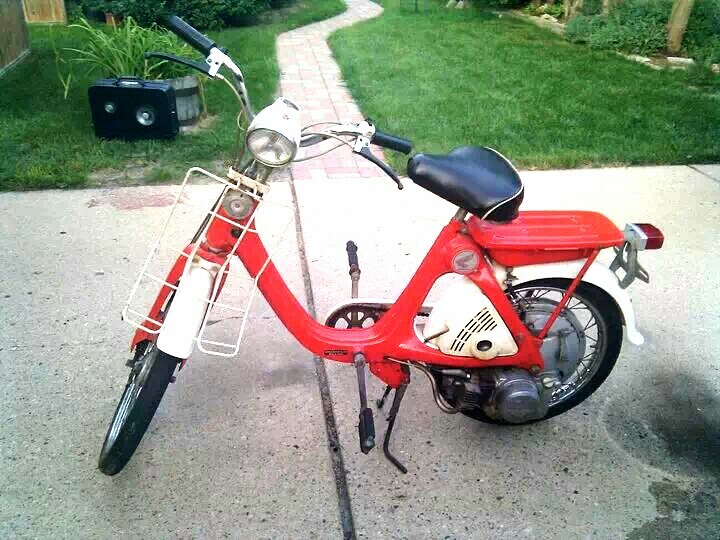 A 1977 to 1980 has two cables, a throttle and a choke cable coming straight up from the carburetor. A 1981 has just a throttle cable coming straight up, but also a vacuum hose for the choke and a float vent hose. 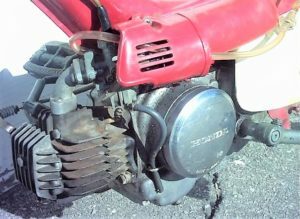 A 1982 to 1983 has a black plastic curved elbow on top, that redirects the throttle cable forward and down, a vacuum hose for the choke, and a vent hose. 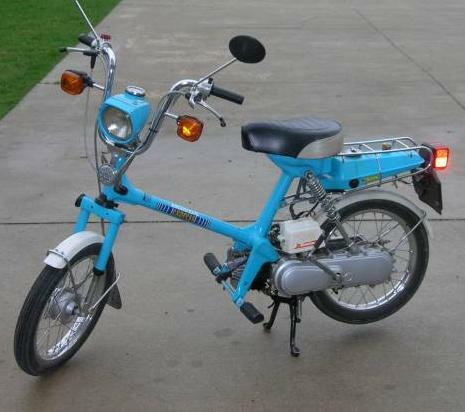 A 1982-83 also has a different frame, a low headlight, and a two speed transmission. The Honda Express throttle cable curves rearward and loops downward to get below the carburetor, and then goes forward into the frame tube. The loop design adds friction, but it makes a good clean step-thru frame without any cables or wires hanging out. The 1981-83 automatic choke plunger mechanism itself is not replaceable. 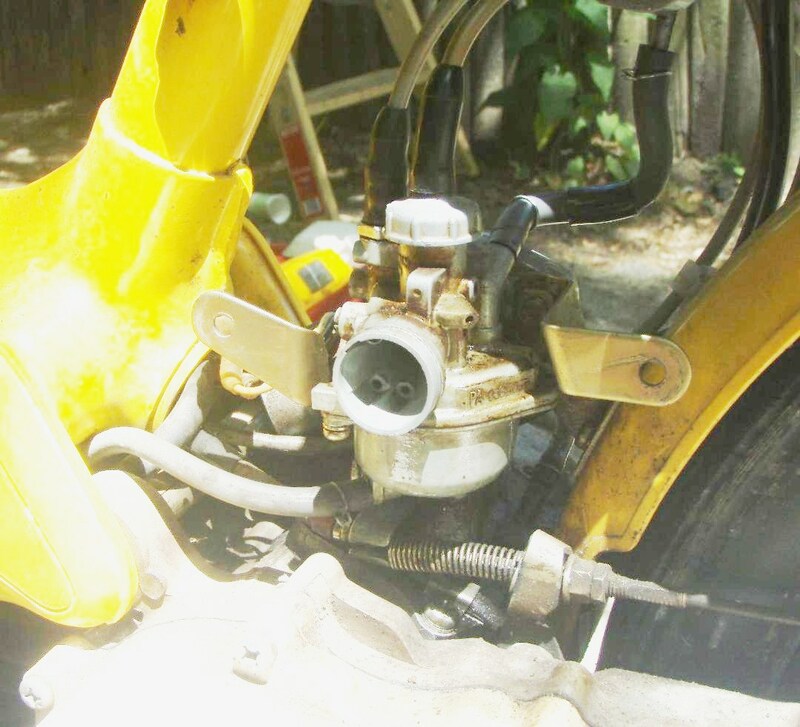 This is the most sophisticated moped carburetor, and also the one with the most hoses. The PA13E-A and PA13B-B carbs are the same as the previous PA15A-A carb, except for stud bolts instead of holes on the mounting flange. The stud bolts are spaced closer by 2mm, and the intake manifold o-ring is smaller, 18 not 20 mm. All of the other parts are the same. See above. 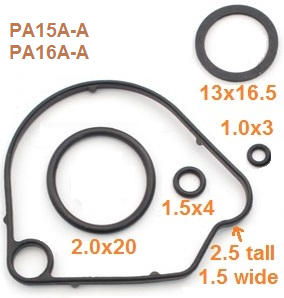 This carb is like a PA15A-A, with M18-1.0 top cap threads, vacuum-operated automatic choke, choke jet in float bowl, tall 2.5 x 1.5 float bowl gasket, no mount studs, non-stirrup type float and float needle, screw-in main jet size 75. 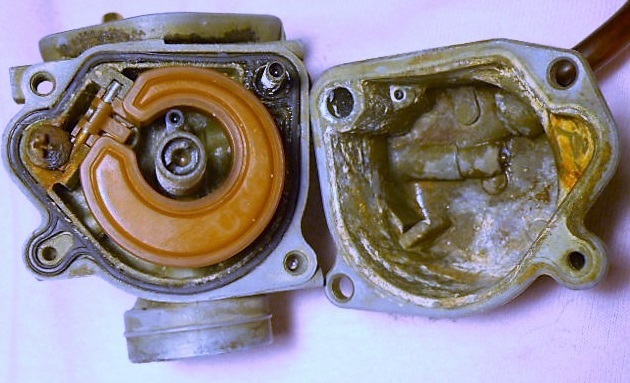 You can tell the difference between a carb with an idle air mixture screw, and a carb with an idle fuel mixture screw, by the shape of the casting at the top of the float chamber. 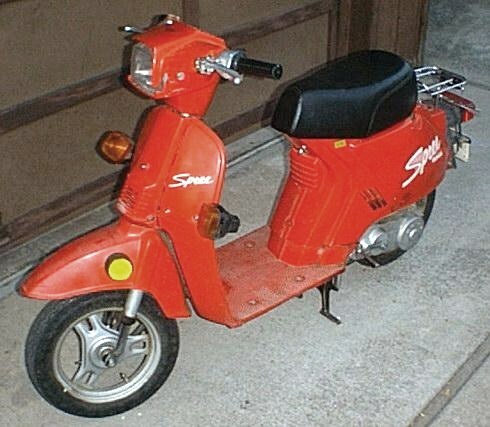 These were zippy 50cc two-stroke automatic scooters that maxed out at 30mph to meet many US state’s moped laws. They have electric start so there is 12 volt battery power to operate an automatic electric choke. They also have a gas gauge and an automatic vacuum petcock on the gas tank. You don’t have know very much to operate one. They had a CVT variator that continuously changes the belt drive pulley size ratio, for very quick acceleration. 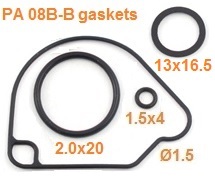 The float bowl gasket in the illustration looks like the NC50-type, but it’s not. 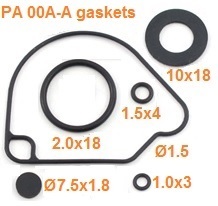 The actual gasket has an additional loop, for a vent and overflow. 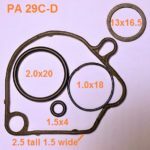 A “tall” float bowl gasket for a 1982-83 NC50 would work fine. 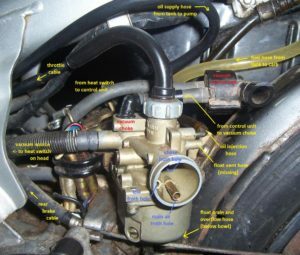 Only if the float overflowed then some of the overflow would leak onto the carb instead of through the overflow hose and onto the ground. From measuring an actual PA 29C-D carburetor, the sizes can be displayed in the PA 29C-D gaskets photo. 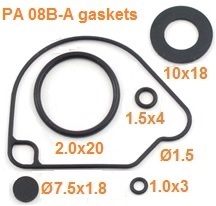 The PA 29C-D gasket set is not available but the PA15A-A gasket set can be a substitute. See above. Idle Mixture Screw: The idle mixture screw is an “air screw” that blocks off an air channel. Main Jet: The main jet is a screw-in, recessed-type, M6-0.75 thread, size 68 (0.68mm). Pilot Jet: The idle jet is not replaceable. It is inside the upper end of the brass tube, pressed into the main body, on the engine side of the main jet. 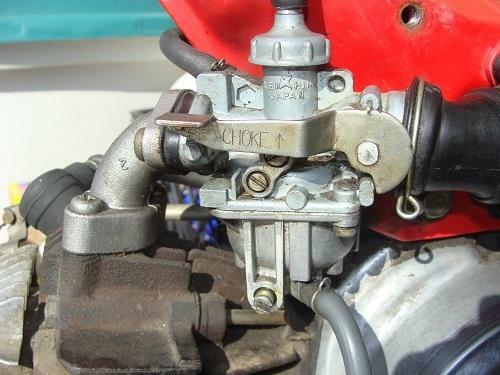 Float Seat: This carb does not have a replaceable float needle valve seat. The seat is part of the main body, and must be cleaned and polished with a spinning Q-tip. You are currently browsing the archives for the Keihin category.